12/16/2008: The final version of Fall from Heaven II released! It finally here. After exactly 3 years of development (it's also FfH's birthday) we have released the final version of Fall from Heaven. Thats not to say that we won't continue to support the mod through patches, but FfH now contains all the features we had planned for it. We now turn our attention form makign the game to perfecting the game through bug fixes, documentation and specific tweaks that just weren't possible to do while the mod was going through such massive changes. This version also contains the Fall from Heaven scenarios. 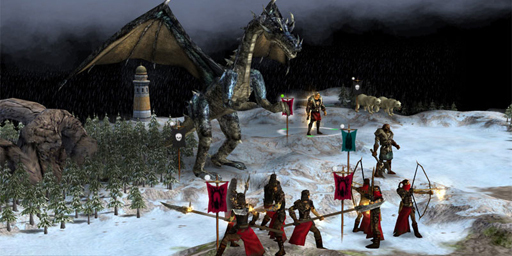 There are 18 and they feature a variety of unusual game rules and victory conditions, some fo the scenarios are in series that require you to complete one to get access ot the next one, the players actions and decisions in one scenario can effect the events in later scenarios and a full storyline following many of the most popular FfH characters. Check out the full change log for all the changes or join us in the Fall from Heaven forum to discuss the mod. Download: Fall from Heaven II. Fall from Heaven II 0.40 will be released on December 16th, 2008. This versions contains the scenario's for Fall from Heaven which will allow players to play through historic battles, visit reknown locations on Erebus and play games with unique victory conditions. 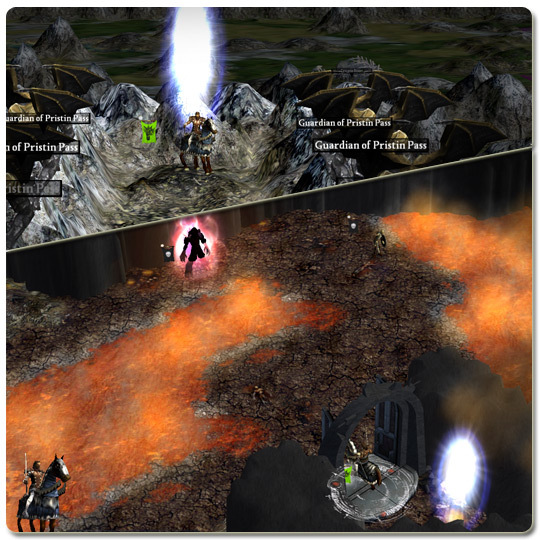 Many feature changed game rules or new features that don't exist in the epic game such as Portals that lead to dungeon areas or underground tunnels. Though beware, for the choices you make in some scenarios are important. Give Amelanchier to the Baron and he may become an enemy in a later scenario. Will you take the easy path now, and pay for it later on or complete difficult quests early on to weaken your enemies or earn yourself future allies? 1. The Illians, rulers of a former age survive in the worlds snowy wastes after the death of their god. Now you can guide them through the rituals required to resurrect their god and reclaim their dominion over Erebus. 2. Explorable Lairs. You can have your units explore the ancient dungeons, barrows, ship wrecks and ruins. They may find treasure, allies or powerful enemies within the lairs. 3. New Challenge modes have been added. These game options create alternate rules for the game like the Final Five mode where the player with the lowest score is removed from the game every 50 turns until only 5 players remain. Or the Increasing Difficulty mode where the game difficulty increases as the game goes on. 4. The Trophy Hall. Earn achievements by winning games under various conditions or accomplishing feats within games. Check out the full change log for all the changes in 0.34 or join us in the Fall from Heaven forum to discuss the mod. Download: Fall from Heaven II 0.34. Fall from Heaven 2 version 0.33 released today. It includes significant changes to the Balseraph and Elohim civilizations, improved performance in games with lots of units and a mini-game called Somnium. In Somnium players can challenge AI and human player to a card game and win attitude bonuses and gold. Check out the full change log for all the changes in 0.33 or join us in the Fall from Heaven forum to discuss the mod. Download: Fall from Heaven II 0.33. 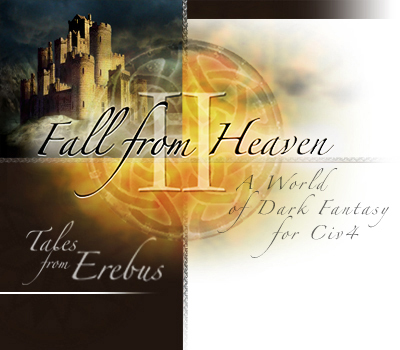 Fall from Heaven 2 version 0.30 (codename "Shadow") has been released. This version introduces two new religions to the game, the Empyrean, who worship Lugus the god of light and the Council of Esus, who worship the god of deception. It also adds two new playable civilizations, the mysterious Sidar and the Svartalfar, dark cousins of the Ljosalfar. Check out this thread for more information. Download: Fall from Heaven II 0.30. We owe a huge thanks to the playtesters who played and reported issues on our 0.24 BtS beta. Because of that work we are now able to release Fall from Heaven II version 0.25, the first public version available to run on Beyond the Sword. The new version contains the updates brought from Beyond the Sword (Advanced Starts, Enhanced AI, Events and Vassals being some of my favorites) as well some new FfH features. The spell system has been rewritten from the ground up so that the AI can understand its use. 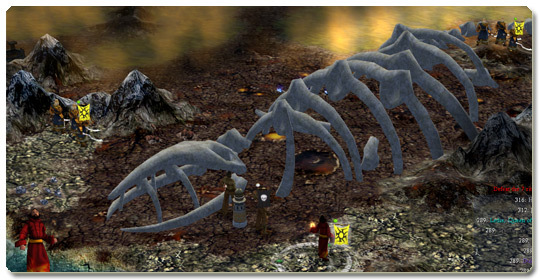 Unique Features were also added in this version, rare features that can appear on random maps and give special benifits like the Mirror of Heaven or the Broken Seplucher. We also added a host of new game options, select Wildlands to double the amount of aniamls that appear in the game or Labruscum to have the barbarians start with several cities scattered around the map. Thank you to GameFlood, the judges and the community members that voted for us. The prize winnings have been donated to the wonderful people at Unicef (who knew that our twisted tales would end up making the world a better place). The fine folks over at Apolyton were good enough to invite me to join in their podcast, answer interview questions and generally talk about Civilization. Check it out to hear about my first modding experience (Christian Strip Poker) and some behind the scenes information on creating Fall from Heaven and what it was like to work with Firaxis on Beyond the Sword. You can download it here or check it out on iTunes. 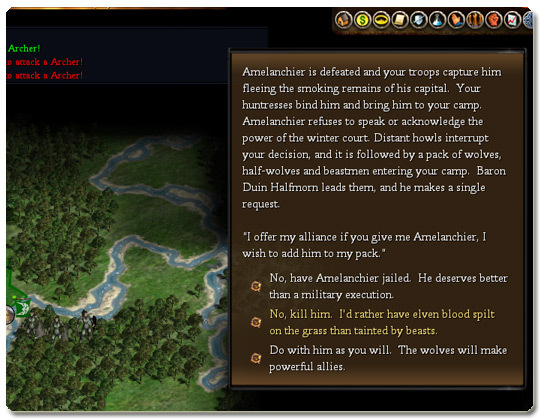 This is the last version of Fall from Heaven 2 for vanilla civ. It contains hundreds of art and balance polish changes to really clean it up and make it ready for its final version. You can download it here. IGN posted an interview with Kael about the scenario the team created for inclusion with Beyond the Sword. Check out the full article for details and screenshots. 05/25/2007: Fall from Heaven II 0.22 Released! The team released version 0.22 today. It contains a large number of balance changes and 4 new major features: Mana Effects, Affinity, Animal Packs and the Trophy Hall. Check out the changelog for the full details. I forgave her, but she couldn't forgive herself. It wasn't unusual for Talia to worship at dusk. She revered it as I revered the dawn. She said that as the world slept the spirits came out to wander across it and often slipped into bed late, warm from the magic she channeled and smelling of flowers that covered the small shrine she kept in the temple. She was beautiful and I loved her. I arose one morning to find that she never came to bed. It was three days since she told me about her affair and through many tears, both in anger and sadness, we worked through it. I promised myself that I would forget what she had done, that I would trust her again. But in seeing the empty bed my mind leapt to suspicions. I found her body laying before her shrine. She had expended her spirit entirely in casting, let her life flow from her for no reason other than to give it up. There was a short note with her, it read simply "I'm sorry." There was no salvation for her. And I shed tears once again at the altar of Lugus. Angels tended to me, brilliant compassionate beings who cried along with me. In time we divined Talia's last hours. She hated the pain she caused me and prayed for some relief. But the druidic spirits consoled only time and patience to heal those wounds. Another voice had offered a more immediate solution. That was the demoness Lethe, Queen of Sorrow. She whispered to Talia as she had thousands before. Bade her to forget her life and enter the abyss to escape her pain. And Talia followed it, killing herself at the shrine, believing somehow that she was making it easier for me. Now we sail towards an idyllic beach. The tides beat regularly against white sand that rises smoothly to a thick ridge of mountain. It's hard to believe that the Fane of Lessers, the place where Agares dwelt during the godswar, where the souls of the damned are drawn, lies beyond those mountains. This may be madness. To assault the stronghold of evil with only those few volunteers that could join me on this galleon. But Lethe is somewhere within that twisted hellish terrain, and I will make sure that her voice, and those the demon lords that dwell with her, will be removed from Erebus.